As it becomes more challenging to cut through the noise of information available to consumers today, marketers are seeking new ways to engage and acquire customers. ‘Content’ has emerged as a popular solution, with marketers directing more resources to the creation, curation and distribution of articles, video, white papers, infographics, how-to-guides and even cartoons to engage audiences. But, despite its popularity, content marketing is still in its infancy. For every great content marketer there are thousands of marketers that aren't clear how to approach it. 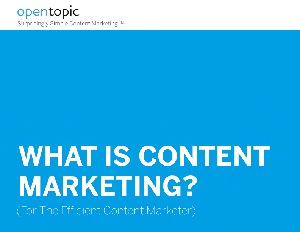 This document defines content marketing to help both experienced and non-experienced marketers understand what content marketing is, how to approach the content creation and curation mix as well as illustrate how great content marketing doesn’t have to be complicated or expensive.